Come join us in =ADK= Discord To download the Discord app go here: https://discordapp.com/ Discord is going to have a small learning curve over teamspeak so be prepared, but the fellow members as well as the Admins will gladly help you if you have any issues with installing or using the app. Once you have Discord installed all that's left to do is click the button below. Welcome to the future of the =ADK= Community. Click Here To Join! The =ADK= Multi-Gaming Community was founded in mid 2009. =ADK= was created as a fun, laid back gaming environment to give gamers for any game a place to call home and be able to help expand the community to others around the world. If you are looking to learn more about ADKGamers please feel free to message or join our Discord Server and speak with one of our recruiters for more in depth history. If you are interested in joining ADK please visit this page to view our recruitment application.You can also find a copy of our rules and policy located here as well. 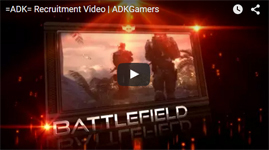 Thank you for your interest in ADKGamers. Please feel free to sign up on the forums and partake in the discussions as well as joining us in our Discord server as well. Looking forward to seeing you around!